Hampshire recorded their first win of the County Championship Division Two season with an eight-wicket success against Gloucestershire at Bristol. The hosts, 308-9 overnight, added just 24 runs to their second-innings total to set Hampshire a target of 215. An unbeaten century from England opener Michael Carberry, plus a quick-fire 58 from 37 balls by James Vince, saw the visitors home in convincing fashion. They put on an unbroken 101 for the third wicket as Hampshire eased home. Meanwhile, Hampshire confirmed that wicket-keeper Adam Wheater has suffered a broken finger. The 24-year-old was injured in the field on day three and an X-ray on Tuesday night confirmed the break in his finger. "Hampshire made light work of reaching their target and Michael Carberry's unbeaten century was a timely reminder to the selectors. 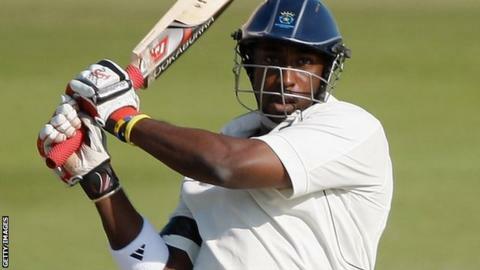 "The opener knew he had a lot of time to score the required runs and he batted in measured fashion in the morning but finished explosively; when partnering James Vince at the death they scored at more than 10 an over for the last half hour and Carberry reached his century with two successive sixes. "Gloucestershire were second best for most of the match, and they will have to bowl with more penetration if they are to have a successful season."